The Everfit Healthcare Pro Drop Chiropractic table is a very popular variable height drop table with 4 manual drops used by healthcare professionals. 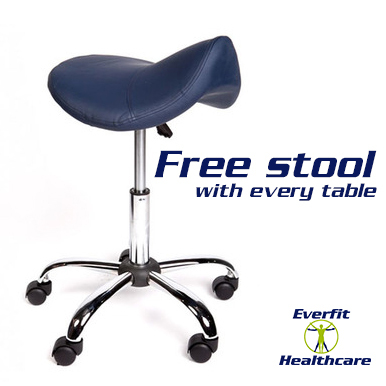 This Everfit Healthcare Pro Drop Chiro Table also features an adjustable height pelvic and head section which is easy to adjust for the Doctor to perform proper treatment on patients. The head sections width can also be adjusted and tilted to assist the patient and practitioner. The drops work on a ball bearing construction. Professionals call for further possible Discounts!! Best price guarantee!! Everfit Pro Drop offers the best value for professionals, a great addition to the treatment room at a great price! Each drop section can be individually tensioned on each side of the table. The table also has adjustable footrests, easy to use adjustments and high density foam top covered in a stylish vinyl cover for easy practitioner use. Each Dr is happy with the tables. Talk soon.